J.C. Penney Stock: Value Trap or Value Play? Should you buy this battered retailer at all-time lows? J.C. Penney (NYSE:JCP) shares recently plunged to an all-time low after the department store chain slashed its third-quarter outlook ahead of its earnings report due on Nov. 10. The retailer now expects to report an adjusted loss of $0.40-$0.45 for the quarter, which compares poorly to its loss of $0.21 a year ago and the loss of $0.18 that analysts had expected. J.C. Penney attributed that big reduction to a decision to liquidate slower-moving inventory, especially in women's apparel. That desperate move could lift its comparable-store sales by 0.6%-0.8% for the quarter, which tops expectations for 0.4% comps growth, but comes at the huge cost of margin-crushing markdowns. J.C. Penney also slashed its full-year earnings guidance to $0.02-$0.08 per share, compared to its prior forecast of $0.45-$0.65 and the consensus estimate of $0.43. It posted breakeven earnings in 2016. Looking ahead, J.C. Penney expects to post -1% to flat comps growth for the year compared to a prior forecast for 1% comps growth. These grim numbers all indicate that J.C. Penney's turnaround has run out of steam, but value investors might think that the stock is now too cheap to ignore. Let's take a closer look at the bearish and bullish takes on J.C. Penney to see if it's a value trap or a value play. J.C. Penney is being rocked by the same headwinds that many other brick-and-mortar retailers face: aggressive e-tailers, sluggish mall traffic, fickle consumer tastes, and the rise of fast-fashion retailers like Inditex's Zara and H&M. Some high-end department stores like Nordstrom (NYSE:JWN) have weathered those headwinds by selling higher-margin luxury goods within smaller stores. But other mid-range players, like Macy's (NYSE:M), have struggled to move low-margin products in oversized stores. That problem was magnified in the low-end market with J.C. Penney, which needed much stronger sales growth to balance out its even weaker margins. 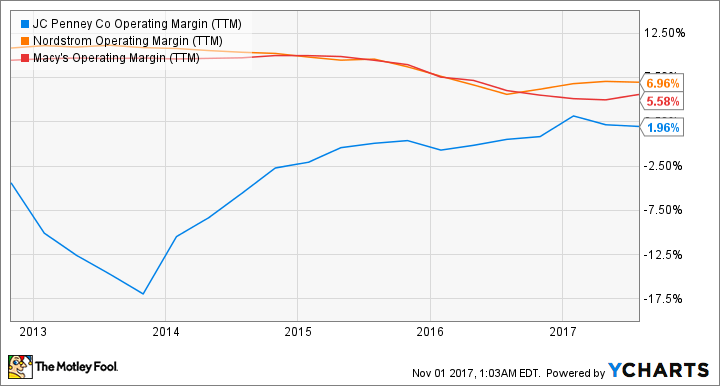 J.C. Penney's operating margin has improved over the past few years, but remains much lower than Nordstrom's and Macy's. J.C. Penney generated average sales of only $105 per square foot over the past 12 months, compared to $369 at Nordstrom and $150 at Macy's. The average J.C. Penney store is also 18% bigger than the average Nordstrom, but 33% smaller than the average Macy's. Therefore, it looks like J.C. Penney needs to shrink its stores to boost its overall store productivity, but its average store size has remained roughly the same over the past five years. The bears will also point out that a lot of J.C. Penney's newfound profitability in 2016 and (possibly) 2017 comes from non-recurring asset sales. If we exclude those sales, J.C. Penney's core business is still operating at a loss. J.C. Penney expects to generate $200 million to $300 million in free cash flow (FCF) for the year, which would mark a big improvement from its FCF of $3 million at the end of 2016. But once again, much of that cash comes from asset sales and store closures instead of actual growth. Moreover, the company was still shouldering $3.8 billion in debt at the end of the second quarter -- $232 million of which matures within the year. The bulls will point out that J.C. Penney CEO Marvin Ellison is trying to turn things around with several big initiatives. The company is forging new partnerships with home improvement retailers like Ashley Furniture and Empire Today that have held up well against e-commerce challengers. It signed a deal with Nike (NYSE: NKE) to add small outlets to hundreds of its locations to boost store traffic, and it's investing heavily in plus-size and athleisure apparel, both high-growth niche markets in the otherwise sluggish apparel market. It's also investing more heavily in its e-commerce ecosystem and using analytics to make pricing and promotional decisions. But most importantly, J.C. Penney's stock looks dirt cheap, with a price-to-sales ratio of 0.1 and a price-to-book ratio of 0.8. That's much lower than the average P/S of 0.3 and P/B ratio of 2.3 for department store chains, and indicates that any good news could cause the stock to rebound. That rebound could be easily enhanced by a short-squeeze, in which those betting against the stock would try to sell and get out when the price starts to rise, since 53% of its shares were being shorted as of Oct. 24. So is J.C. Penney a value trap or a value play? J.C. Penney stock looks like it might bounce from its all-time lows, but I'm not convinced that rebound would lead to a sustainable rally. In the past, J.C. Penney's positive comps growth and improving profitability made it a potential long-term value play. But J.C. Penney just told us that it can only post positive comps growth by abruptly liquidating its inventory -- which paints a very negative picture of its long-term prospects. Therefore, I think that J.C. Penney is a value trap at these levels, and could burn a lot of bottom-fishing bulls.